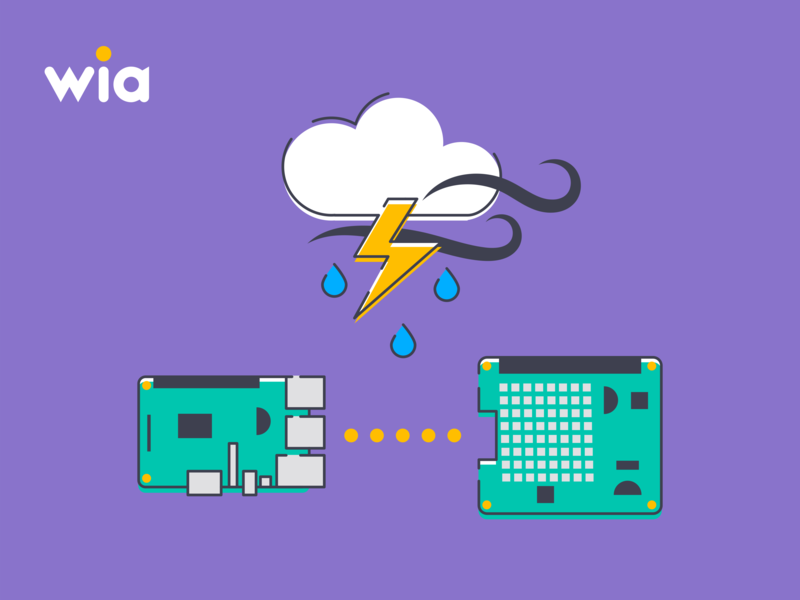 In this tutorial, we will go over how to create a weather station using a raspberry pi and send events to Wia. This is an updated version of our old tutorial. There have been several changes to the Wia dashboard and code since our last tutorial. Node.js and NPM must both be installed on the raspberry pi. If you do not have it already installed, learn how to install node.js here. First, you have to set up the Raspberry Pi. Our tutorial will walk you through it! Be sure to follow each step carefully. When you're ready, run ssh pi@('RASPBERRY-PI-IP-ADDRESS'). This will allow you to begin working in the raspberry pi terminal through your computer. First, we need to create a folder on the raspberry pi to store our files. Create a new folder called wia-wether-device. Next, initialize the package by creating a packackge.json file using the command line npm init. Hit enter for each of the prompts, right now they are not important. Once you are through that, you can install the Wia SDK onto the raspberry pi. Install the Wia SDK by using the command line npm install --save wia. Next, we must install nodeimu so that we can use the sensors. Use the command npm install --save nodeimu. Go to the Wia Dashboard and select Create a New Space then select Devices. Add a device and give it a name. Now, in the Configuration tab for your device, you will find device_secret_key which should begin with d_sk. This will be important later on. Create a file called index.js. Then, copy the code from the example below and paste it into the index.js file. Replace the device_secret_key with your device's secret key. Now, you should see events appearing in the Events tab for your device in the Wia Dashboard. Next, we will make a few widgets through Wia to present the data that the weather station collects. Log in to the Wia dashboard, and navigate to your device. 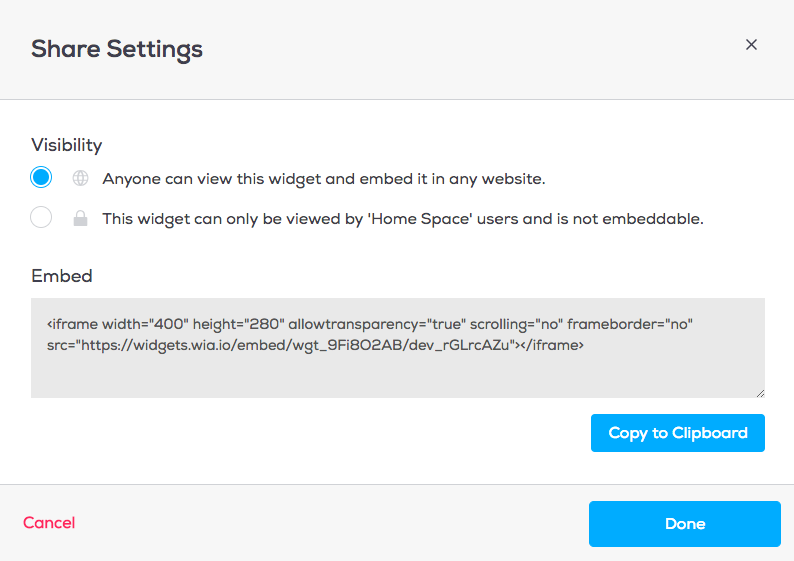 Select the widgets tab and create a new widget. Name it Humidity. For the event box, type humidity exactly as it appears in the node.js code that you copy and pasted before. Select done and you will see the latest update! Follow these steps for temperature and pressure to finish your Weather Station project. Next, we will create a webpage and host it on GitHub so that we can check the weather from our weather station any time! If you don't have a github account already, you can make one here. Once you are set up with github, create a new repository and name it your-username.github.io. Check the box to initialize with a README. So far, our webpage is pretty blank. Navigate back to your Wia Dashboard. In the overview for your device, you can see your widgets. In the upper right hand corner of the widget, there should be a box with an arrow. Click the box. A screen like this should pop up. Do this again with each widget. Now, you should see the weather from your raspberry pi appear on your own webpage!